Self guided walking tour Reykjavik. Do it yourself and save money! Home > Travel with me > Self guided walking tour Reykjavik, Iceland. Do it yourself and save money! Self guided walking tour Reykjavik, Iceland. Do it yourself and save money! The growth in Iceland’s visitor numbers has been growing at an exponential rate. Before the turn of the century, visitors to Iceland never reached 100,000 per annum. Shortly thereafter, various areas in Iceland were used as backdrops for movie scenes and rock music videos. The world became alive to the beauty of this country, and visitor numbers started to grow. In 2008, Iceland suffered a significant blow to its economy with a credit card crash, and the country started to look further afield in its strategic recovery. In 2010, Iceland made global headlines when the volcano Eyjafjallajökull erupted, causing disruption to travel plans for weeks on end. Incentives were offered to airlines to bring the people back to Iceland. All of this has contributed to a new found love for Iceland that has not abated. A glance at the passenger projections graph from the Visit Iceland tourism website shows an almost vertical rise from around 2010 when just under 500,000 people flew into Keflavik Airport. Given back in the late ’90s these numbers were below 100,000, this was already showing a sizeable improvement. In 2016, 1.767m people came to visit Iceland, 39% more than the previous year. That number is expected to go north of 2 million visitors in 2017. Looking to see more of Iceland? These photos of our roadtrip around Iceland’s ring Road will make you want to go straightaway. The majority of visitors to Iceland enter by air, through Keflavik Airport, located approximately 38km from the centre of Reykjavik. As the capital of Iceland, most of Reykjavik’s visitors would find themselves here at some point during their stay. For many, Reykjavik is as far as they get, popping over from other European destinations for a long weekend. Others, particularly those flying with Iceland Air, use Reykjavik as part of their journey stopover. Iceland is an expensive country. Read more here for tips on how to save money in Iceland. Reykjavik is a city well worth stopping for, but I don’t believe it needs more than several days. Whilst noticeably different from many of the world’s big cities, there’s so much diverse and incredible beauty on offer in the rest of Iceland to encourage you to get out from Reykjavik, if only for a few more days. In a city that can take a toll on your wallet, a self-guided tour offers the perfect solution. Reykjavik is an easy city to walk, and you can do it at a pace that is entirely your own. We took a full day and a half to explore all of these sights and areas below, stopping in at many of the cafes, food stores and coffee shops along the way. If walking around Reykjavik on your own is not something that suits you, there are plenty of tours available where a guide can talk you through all the key sights. Like much of the architecture in Iceland, it can be mistaken for being uninspiring. But, it can’t be compared to the centuries-old beauty of many of the European Old Towns. In a country as remote as Iceland, building materials are harder to source and the structures, therefore, take on a different form. The beauty lies in the colour and in the inspiration behind the designs. The building of this church commenced in 1945 and was completed in 1986. It stands at an impressive 74.5 metres. The design was said to represent the basalt rock columns that can be found along some of the beaches here. It’s always great to be able to get up high in a new city to get some perspective. From here a wonderful view is possible over the city and the water, across to the mountains. On a clear day, the view of the coloured rooftops below is spectacular. Tickets can be purchased to access the elevator that takes you to the top for this amazing view. For accurate ticket pricing and opening times, click here. The Althingishus (Parliament House) was constructed in 1881. It is now one of the oldest stone buildings in Iceland. Its main function today is as the place where the 63 elected members of Parliament discuss and pass legislation. Built in 1906, the Culture House reminds me of a small European palace. It originally was the home of the National Library and archives but is now actively used for a variety of exhibitions by the museums and the National Gallery. Nearby there is a beautiful park which is worth strolling through. 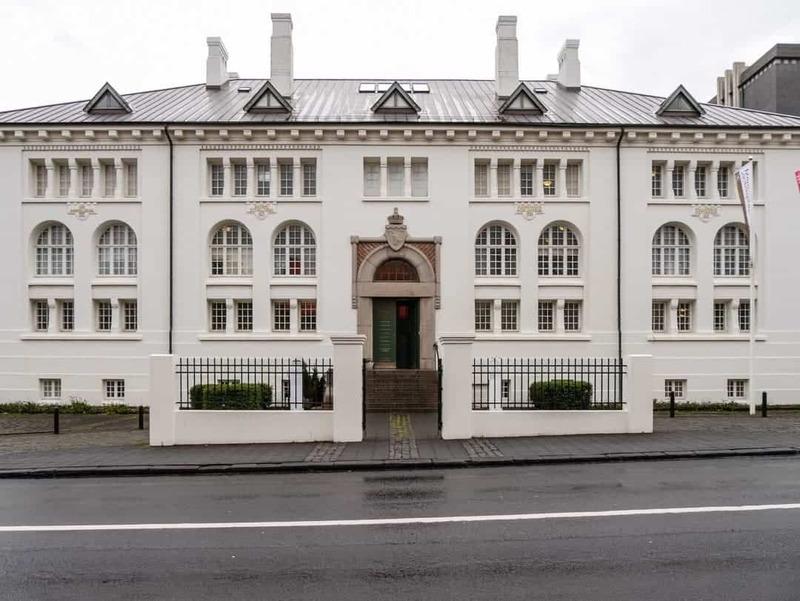 This is the oldest junior college in Reykjavik. 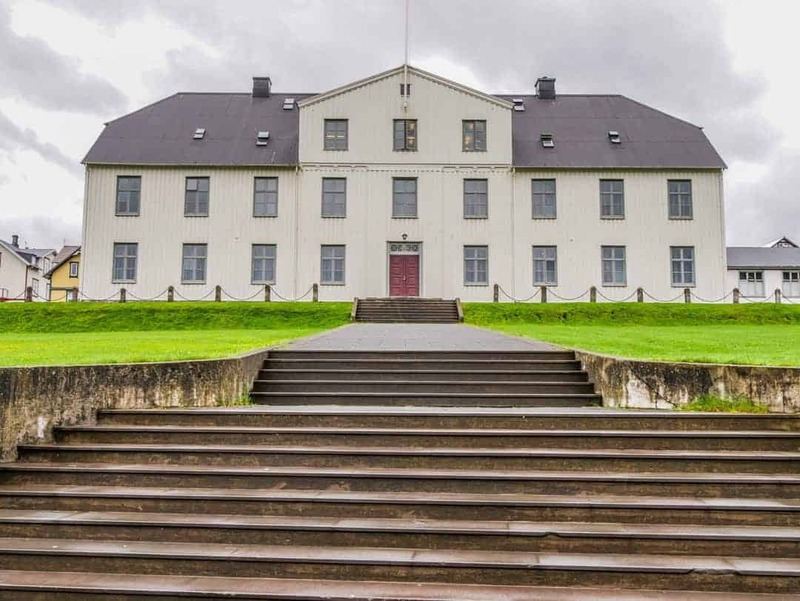 Dating back to 1056, it’s also one of the oldest schools in all of Iceland. Most of the country’s politicians have been educated here, including all but four of the nation’s prime ministers. 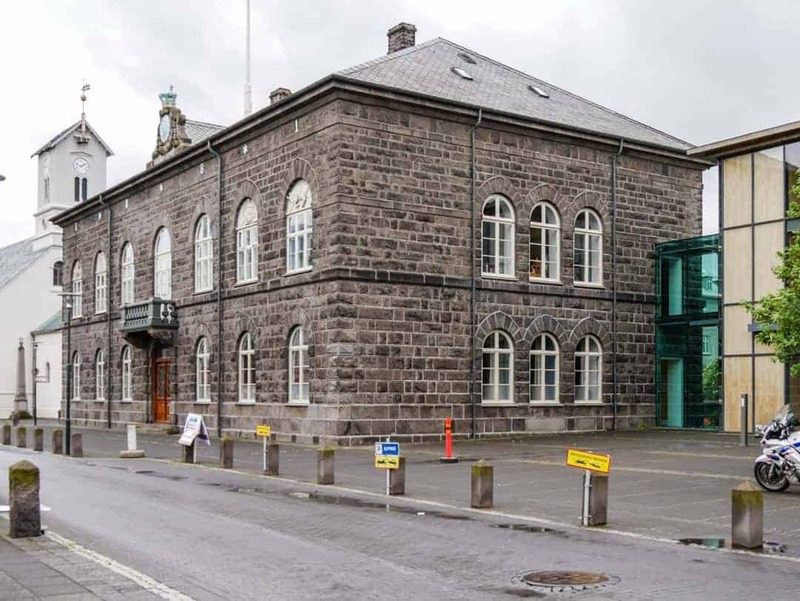 This seemingly plain building is the office of the Prime Minister of Iceland. It was interesting to see the lack of security surrounding it. As you walk along any of the streets that run parallel to the water, a quick glance down a side street will almost assure you of a view. Sometimes, depending on where you are, the view will also take in the mountains. Street art is everywhere in the world and Reykjavik is no exception. Here, it’s not located in one area, nor is it hidden. Strolling around the streets will produce countless examples of great street art, my favourites of which are the ones that cover an entire side of a building. Street art and plenty of brightly coloured corrugated iron and painted shop fronts ensure there is colour aplenty in the streets. 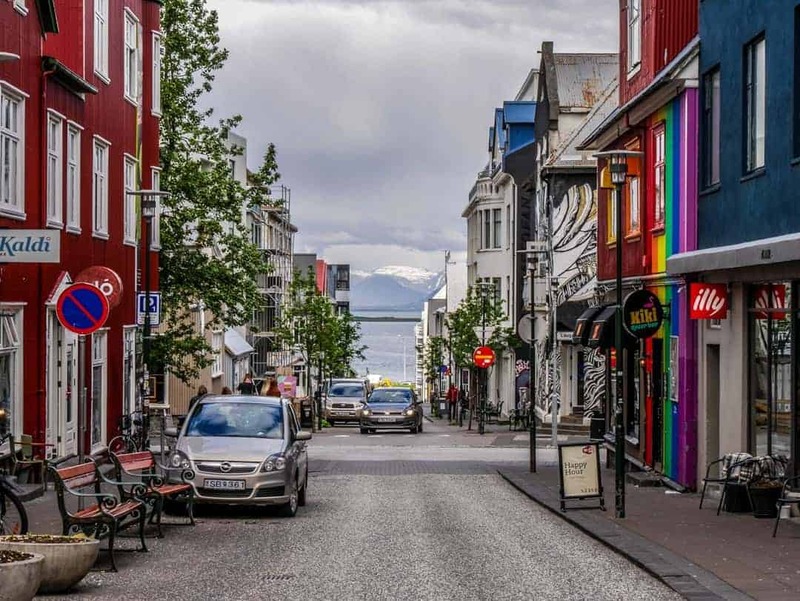 Laugavegur Street is full of funky coffee shops, cafes, bars and juice bars. It’s also the place for some good shopping, especially Arctic winter clothing, fashion and souvenirs. Prepare for the wind if you venture down to the waterfront. Not far out of the main street you’ll find this expanse of water with a promenade along which you can walk or ride. Down here, I got my first real insight into what Iceland was possibly going to be like. Mountains, close enough that you feel you could touch them and still covered in white snowy caps, even though summertime was almost here. Rolling green hills, with houses dotted sporadically across them, and the wind….oh the wind, how it blows in Iceland. The Solfar Sun Voyager is a striking sculpture down here and one of the most photographed too. For good reason, given the connection to Vikings here, most people, including myself believed this to be a representation of a Viking ship. It is, in fact, a dreamboat and is seen as a symbol of hope and light. Harpa is the fantastic looking glass building on the waterfront. As the Concert and Conference Centre, it’s an ongoing hub for events and functions. It’s an impressive looking building built from glass and once again representing the basalt rock columns found throughout Iceland. At night, the glass provides the perfect backdrop for a light show. We weren’t able to witness this as there quite simply wasn’t enough darkness! Inside there are also large open spaces, where people sit on chairs or even the stairs to read or quietly reflect. It’s free to get inside and hang out but many of the events are usually ticketed and therefore there is a cost attached. There’s also a souvenir shop and cafe inside. At the end of the waterfront promenade is the Old Harbour. It mightn’t look like much, but I can forecast that this area will become quite a hub for foodies in the coming years. Already there are signs of a burgeoning food and providores area down here and there are some amazing restaurants too. Bringing in fish fresh from the trawlers, many of these restaurants also offer stunning views as well as great food. It is also the area where most of the whale watching and puffin tours are and is home to the Maritime Museum as well. 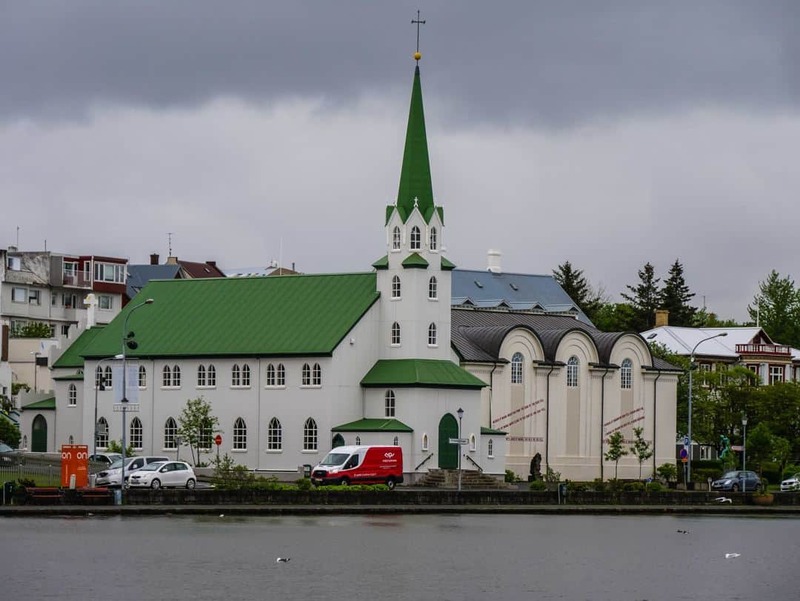 Tjornin Pond is a tranquil area right near the City Hall and the beautiful church of Fríkirkjan í Reykjavík (see image below). It’s typical of the Icelandic churches around the countryside, all white with coloured roofing. The lake is alive with swans, ducks and a variety of other birds and is also the perfect spot for a walk or run. The City Hall on the edge of the lake is probably close to the ugliest building in Reykjavik. I couldn’t get any inspiration from the outside, but with the Office of Tourism on the inside, there’s plenty of inspiration to be found there. Like any city, there’s often so much to find if you have the time to just get lost in the back streets. We found some interesting cafes, quirky little gardens, hidden laneways and plenty of colour. How long does it take to do a walking tour of Reykjavik? This type of walk can be done as slowly or as quickly as your itinerary allows. The Reykjavik walking tour maps below give a general indication of the route we walked, starting from our apartment. It can certainly be done in one day. We took a little longer as we had plenty of stops along the way to look at the buildings more closely, to take time out along the water and to eat and drink of course. This map constitutes the main part of Reykjavik. It is by no means exclusive as there are other parts of Reykjavik that are worth seeing but aren’t on this route. This route took us into some of the back streets so that we could get a feel for more of the local life, away from the business of the main streets. Getting to Reykjavik by air is the easiest way with many full fare and budget airlines stopping here. Iceland Air is the national carrier and flies from many European destinations and also fly regularly to the USA. We flew Iceland Air from London Heathrow. Whilst we paid full fare prices, the in-cabin service and size of seats more closely resemble a budget offering. For a list of airlines that fly to Keflavik Airport, click here. The Flybus operates from Keflavik Airport and is the most convenient and cost-effective way to transit into Reykjavik. Alternatively, private transfers may also be booked to take you directly into the city. A car ferry operates on a weekly basis from Denmark through to Seyðisfjörður in East Iceland. Depending on your budget there are a variety of hotels, hostels, apartments and Airbnb to stay at. We stayed at the City Town Apartments at the end of Laugavegur Street which was very central. Or check out any of the other hotels and places to stay in Reykjavik via Trip Advisor. That looks a most interesting city. I might get there one day although I’d hate the wind! Architecture is rather stark but modern looking and not unattractive – plenty of colour. Love all the street art and very interesting to see the bedding in your apartment! Ha yes if you don’t like wind this is probably not the place for you 🙂 You are right about the architecture, definitely a bit “brutalist” in parts but the colour more than makes up for it. This is an amazing guide, Iceland looks relaxed. Love the street art, and the government house, so laid back you could pass it for any other building. Interesting though how there is no security. Maybe one day it will change but it’s nice to think they don’t need it in our world of today. That top church is one of the more fascinating buildings I have ever seen. Whenever a travel blogger captures it, I am floored. Can’t explain it. Just really really different than other churches. Iceland is certainly on the travel blogging rounds as it should be. We were thinking of a quick NYC to Iceland trip around the holidays but are gonna chill in NJ; just booked a Thailand house sit in February, so it’ll be here and off to SE Asia again. You certainly lead an eventful life Ryan. Thailand will be amazing. I actually like the simple architecture of Reykjavik with white washed walls and colorful roofs. We are considering trying a trip to Europe with WOW air and a 1 day stop over there. Your article and walking tour make me want to go ahead and book it. Wow fly so regularly there now. It’s definitely worthy of a visit. Thanks Danik. I agree with everything you have said – top town! Iceland tourism has gotten very popular, and it is now particularly expensive. So a self guided walking tour sounds like a great idea to save money, thank you for the great tips! Yes on both counts. Always a good opportunity here to look for savings. I think walking is the best way to see most cities! And making your own “tours” are the best way to save money in Iceland. I just got back from Reykjavik, and this post definitely makes me miss roaming the streets of this wonderful city. We really enjoyed seeing all the beautiful street art and walking along the waterfront. I was also amazed by the beauty of Harpa, definitely a building you have to go into while in Reykjavik! I’m missing it now too Kaylene. Glad you loved it also. Congratulations! You got the real pulse of the city. I think self-guided tours are the way to go! I really need another trip to Iceland as mine was too short! I was driving around most of the time and spent little time in Reykjavik itself. I don’t regret that – but it would have been nice to explore the city a little more. I did wander through the streets at night and loved how cool it felt – a fun vibe. But it meant I didn’t really get a thorough look at all the landmarks, mainly the shops – and that was because I was on a mission to buy a new NZ-Euro adapter as I’d accidentally thrown mine out on my travels! But fun to explore – next time I would have a couple of days staying within the actual city centre before exploring the rest of the island. Some really great information. My friend is planning a trip here in 2018. I’ll make sure to tell her about your article. For us Reykjavik and Iceland are the stuff that our dreams are made of. We would love to visit the country someday and though one of the reasons for our fascination for the place is the Northern Lights, there is obviously much more to it. Reykjavik is indeed charming and its beauty has been captured stunningly by your pictures. A self-guided tour is what we would love as it gives us the flexibility to do things at our own pace. This is something that is going to stand us in good stead when we do get to Reykjavik. I am yet to see Iceland but I have heard great things. Reykjavik definitely seems to have some interesting corners to explore. I find the government buildings less interesting, although it’s noteworthy that the school looks bigger than the parliament building which is kind of cute. What I loved about your story are more the street art places and the hidden corners. I feel there is quite some interesting urban culture to Reykjavik that needs further exploration. Thanks for sharing your experiences! Loved this post, Kerri. With a zillion road trip and waterfall posts about Iceland, it was refreshing to see something totally different. I think I would be hanging on Laugavegur Street for my travels. What a colorful and fun neighborhood area. Your pictures are spectacular!!! I am a sucker for street art so those colorful creative walls are very exciting for me. But what I liked most from your guided walk is the metal sculpture – that is so beautiful. I wish all cities in the world build sculptures like that. I haven’t been to Iceland before, but I’ve been dying to go for years. Your Instagram pictures of the place are always so vibrant and unique. The Hallsgrimskirkja church really is an odd shape. How tall is it? And does it say anywhere that the Solfar Sun Voyager isn’t actually meant to represent a Viking ship? Great guide, Kerri. We lived in Reykjavik back in 2010 for a bit and one thing I would also say not to miss is a visit to Perlan. It really has gorgeous views over the city. We also love getting an Icelandic lobster soup from the food truck across from the Harpa and wandering in and out of cafes and shops on the shopping street. In the winter, the pond freezes and you can walk right across it or ice skate. Reykjavik is such a cute town to wander around and it’s definitely the heart of Iceland with more than half of the population living in or around Reykjavik. 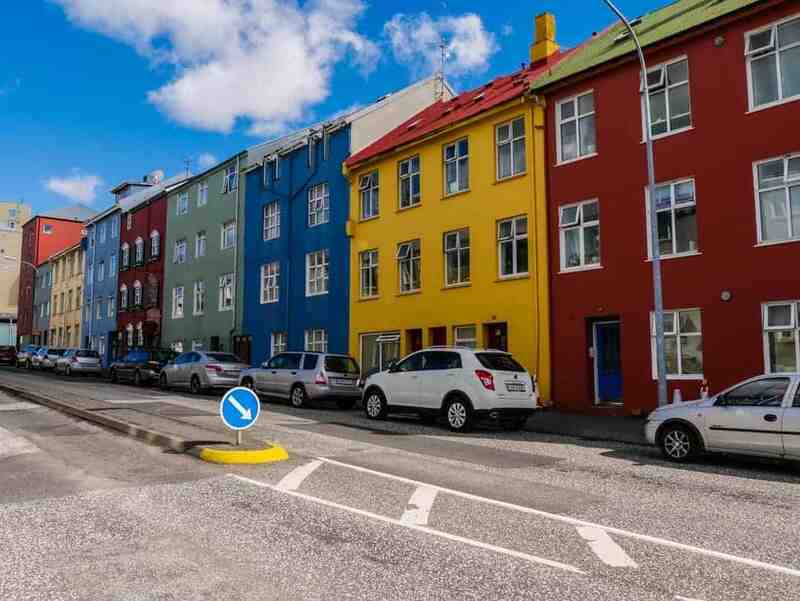 Totally agree that you can easily tour Reykjavik on foot by yourself – we quite enjoyed getting lost in the city streets, finding quirky museums, colorful homes and stumbling across cool street art. Can’t get lost really, everything is so well structured and leads back to the sea worst case! Loved strolling the harbor, and walking into shops on Laugavegur Street – awesome summary of the main sights, and then my favorite, wandering the backstreets :D! I love Reykjavik, such a modern, fun city. I was there last year I went on the Golden Circle tour and went to the Blue Lagoon, walked around the city and ate lots of lobster soup! I like the way you have put together a self guided tour as it is easy to get around Reykjavik. Love the duck photo! You made my visualize nearly the entire city through this comprehensive yet concise post. Great summing up…from the waterfront landscapes to the quirky architecture and unusual street art. I suppose 3-4 days is a reasonable time to get a good feel of Reykjavik. I’ve seen lots of post about Iceland over the last year or so much not so many have focused on the capital so I always thought it must be pretty dull, however this has completely shattered that idea, it really looks like such a fun place! Reykjavik seems fairly walkable with many attractions to explore! I didn’t know houses there are so colorful. The street arts seem fascinating! Wow.. it’s such a fascinating place. NO doubt the tourism is at an all-time high in Iceland. I so eagerly want to visit Iceland and probably want a house there if it would ever be possible. The architecture of all buildings is superb and not mention the natural beauty of this place that everyone is aware of. what a great idea and so true about saving money. Iceland can get really expensive!